When the year started, I said I was going to track the amount of time Belle locked me in chastity and which devices she used. I figured since today marks one-third of the year being over, it’d be a good time to check in. So far this year, I’ve been locked in one of three chastity devices for 70% of the time. This is just an average, though, since I was locked up 99% of January but only 23% of March. Most of March and the very beginning of April was when I was having emotional issues with our dynamic. 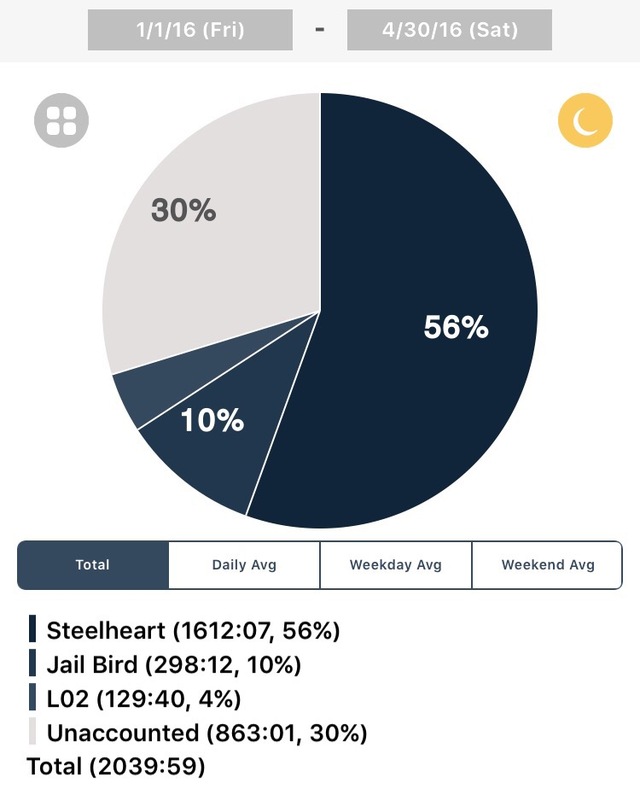 As you can see, the Steelheart is getting the most service. Being Belle’s favorite, that’s to be expected. We’re travelling in May, so the Holy Trainer will show up on the charts pretty soon. I doubt I’ll wear anything but one of those four, though, unless something new comes onto the scene. I also said I was going to track orgasms. I’ve had nine this year which, funnily enough, sounds like a ton to me. On average, that’s more than one every two weeks. Again, though, that’s the average. I had one in January, three in February, four(!) in March, and one in April (yesterday). Interesting that February and March was getting close to what a normal boy might expect in terms of coming (well, maybe half of normal at best) and coincided with my issues in March. Correlation isn’t causality, though. Belle might have been letting me come to make me feel better because I was mopey and not the other way around. Hard to tell. In either case, she has conciously decided to cut me back, hence the single emission in April. My mood has been much better. Take that for what you will. So anyway, over two thousand hours of lock up so far this year. Never thought of it that way. That’s a trend towards six thousand hours for 2016, though unless we have another period like March show up, it’ll be more than that. In the end, it’s not about the numbers anyway. It’s about what Belle wants. All this is just simple math.